Take the elegance of Venice, add the charm of the wonderful Scuola Grande della Misericordia decorated with dazzling lights for the occasion, finish off with guests coming from the four corners of the world and a sprinkle of Ferrari bubbles, and you have the perfect recipe to turn the spectacular masked ball “La Dolce Vita” organised on June 23 by Venetian Heritage and The Americans Friends of the Louvre into the event of the year. 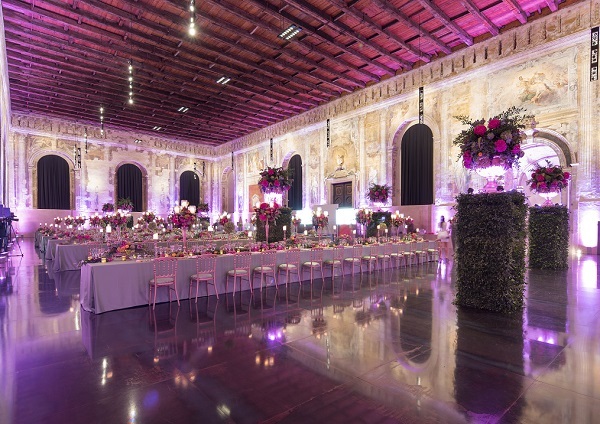 The ball gathered more than 200 international guests, including members of the Forbes family, who took part in an event centred around the charity auction aimed at collecting funds for the renovation of Gallerie dell’Accademia in Venice and the residence of Anne of Austria in Paris. Among the auctioned items were several pieces of art and a customised Maserati Quattroporte GTS Gran Lusso that was sold for 310,000 euros. After a first taste of Ferrari Maximum Brut and Maximum Rosè Trentodoc, the guests sat down for dinner. Ferrari bubbles and the still wines produced by Lunelli Estates accompanied all dishes served: Ferrari Perlé 2010 was selected for the appetizers, the white wine from Trentino Pietragrande 2016 and the red wine Montefalco Rosso Zigguratt 2013 of Lunelli Estates for the first and main courses, and Ferrari Maximum Demi-Sec for the dessert. A perfect evening turned into an unforgettable experience thanks to the combination of a magical location, the elegance of the masks worn by the guests, and the unmistakeable touch of the wines produced by Lunelli Estates.